I find that the success of “one pot” recipes rests on two things: quality cookware and a good flavored broth (most of these recipes use broth as a cooking liquid). One pot recipes need very even heating, so good cookware is crucial. Poorly constructed cookware or vessels that are too thin tend to have hot spots that cause rice and pasta to scorch or stick to the bottom of the pot. I use Better Than Bouillon to make my broth for cooking, which not only offers a lot of flavor, but usually provides enough salt to season the entire dish. If your recipe turns out bland, your broth may be less flavorful or less salted than mine. Sometimes adding a pinch of salt to your final recipe can really help the flavors pop! This rich and comforting Cheesy Vegetarian Chili Mac cooks in one pot and in just about 30 minutes, making it the perfect stress-free weeknight dinner. Celebrate like you're in Louisiana with this easy, filling, and inexpensive one pot favorite, Pastalaya. It's the shortcut pasta version of Jambalaya! This smoky, sweet, and creamy One Pot Roasted Red Pepper Pasta cooks in one single pot and can be on the table in about 30 minutes. This One Pot Sausage & Mushroom Pasta can be on the dinner table in no time and only makes one dirty dish! This delicious and simple Spinach and Artichoke Wonderpot takes less than 30 minutes to prepare and is packed with vegetables. This beef taco pasta is my answer to boxed hamburger helper meals. Real ingredients, real flavor, and really filling. This incredibly fast and easy Creamy Sun Dried Tomato Pasta cooks in 30 minutes and uses just one pot. Make dinner delicious any night of the week! If you're looking for a quick and easy dinner, this Southwest Chicken Skillet is it! Precooked chicken makes this dinner possible in about 30 minutes. Zesty lemon pepper chicken thighs are cooked in one skillet along with orzo, chicken broth, and parsley. Lemon Pepper Chicken with Orzo is a one pot meal. Eggs poached in a rich and smoky tomato sauce speckled with white beans, this Smoky White Bean Shakshuka is the perfect breakfast for dinner! Skillet Chicken with Orzo and Olives simmers together in one skillet for maximum flavor and minimum cleanup. Smoky BBQ sauce, salty bacon, and creamy Monterey Jack cheese come together in this quick, one-dish Monterey Chicken Skillet. Jasmine rice, garlic, and fragrant spices are all cooked together in this Yellow Rice Chicken Skillet. It's a complete meal in one pan! 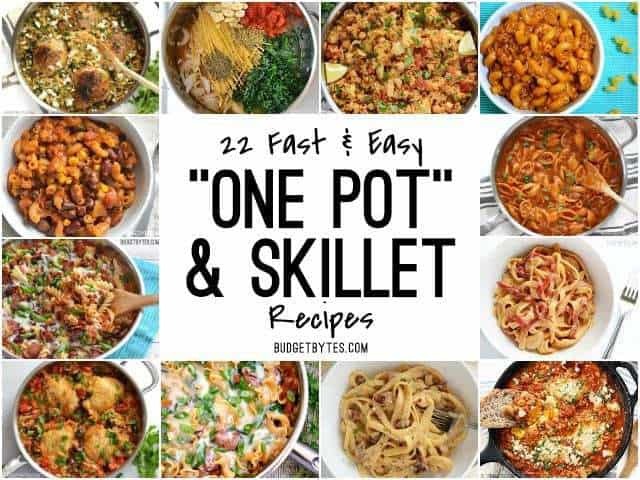 I loved these one pot meal recipes. Your recipes are quite simple and easy to understand and make. i totally enjoyed making Pastalaya for my kids in no time. and they just loved it. Being a foody person i always try to find more and more Indian food recipes for myself and for my family. few days back i have tried one pot meal recipes at http://indiafoodnetwork.in/recipes/dinner/one-pot-meals/ which i thought to share here with your readers too. Hope you will like many from this list. Several people have told me about that method/recipe, but I haven’t had a chance to try it yet! :) I’m very intrigued, though! Thanks for putting these in one spot, they’re some of my favorite of your recipes! These dishes look pretty delicious! Got hungry now! Lots of pasta and rice here, what about the good ol’ potato? Pasta, pasta, pasta, oh rice, pasta. This list was specifically for the one-pot style pasta and rice dishes. I’ve made many of these dishes and added them to my meal rotation. Thanks for highlighting some others that I haven’t tried yet! you forgot my favorite of them all! http://www.budgetbytes.com/2014/04/chorizo-chicken-jambalaya/ Chorizo chicken jambalaya! I make my own broth/stock and it incredibly flavorful. I really think the secret is adding in a few sprigs of “fresh” rosemary (I freeze some just for making stock) per pot, as well as (if you have a small stockpot, like I do) adding in half an onion or a few more cloves of garlic per new batch. I tend to make three or four batches at a time, usually using 2 chicken carcasses and a bag of veggie scraps that I keep in my freezer just for broth making days. This last time I used my usual 2 chickens and the turkey carcass that I had saved from Thanksgiving and did about 6 batches. I think I could have done one more, but I got tired of it being on my stove, LOL! Got about 23 quarts out of it. I also don’t salt it, but always add more salt to recipes anyway, so it is not a problem. :) The stock does take up some room in my freezer, though…I need to invest in a pressure canner to free up some of that space. I’d also love one-pot meals that aren’t so pasta heavy. I know it’s cheaper, but it would be nice to have a mainly veggie/meat dish and use cheap veggies to bulk it out. I love your website!!! I actually squealed with glee came when I saw today’s post. Oops, meant to say ‘squeal with glee’. (Was writing ‘a squeal of glee came out of my mouth’, then changed it. That said, for my fellow GF peeps, if you’re boiling it the old-school way, Barilla has really good GF pasta. Don’t know how it would hold up in a 1-pot dish, but if you just need some pasta & sauce, they’re the way to go. I hope you enjoyed New Orleans! Stews and chili make great pasta-free one pot meals, too, but I left them out of this round up because I felt like they were their own category. :) You can find them all under my “soup” category, though. I definitely want to cut down on my pasta dependency, too, so I’ll hopefully be doing less of that in future recipes. My BF loved that bacon spinach pasta dish so much he requested I make it again like two days later. It was delicious as is, but not super-filling. I added some sliced zucchini the second time and it was WAY more filling. It lasted long enough to feed us throughout the week as opposed to gobbling it all up right then. Sometimes what’s good for you is also practical, hey hey. Would love to see a link to recommended pots/skillets. I’ve had a hard time choosing one after I got rid of a 12″ nonstick skillet that sat unevenly on the stove. And do you find them hard to clean, being not nonstick? I was lucky enough to marry into my husband’s All-Clad. I think they’re pretty expensive, and although they are not non-stick, no matter how badly I think I destroyed a pan, it cleans up like magic. If you can afford it, I highly recommend. I use cast-iron skillets and a porcelain enamel cast-iron dutch oven. I’ve never had an issue with sticking (and I’ve made most of these dishes in them!) and they last forever!! Totally worth the cost. I found most of mine at an antique shop actually. You can google ways to bring them back to life. They seriously last forever. Can’t recommend cast iron enough. thanks, this is perfectI! I hadn’t seen that post. The creamy spinach and sausage pasta is a mainstay for busy weeks in our house! I love how flexible it is too – I’ve taken to adding a bell pepper and garlic along with an ounce or two of cream cheese at the end to make the sauce really silky. It’s so flexible – I’ve adjusted the onion if I have half of one I need to use up, used every pasta shape under the sun, added broccoli, changed up the cheese, added more or less greens depending on what needed to get used… I’m rambling now but seriously, this simple dish makes me weak in the knees with how amazing it is! Great list! 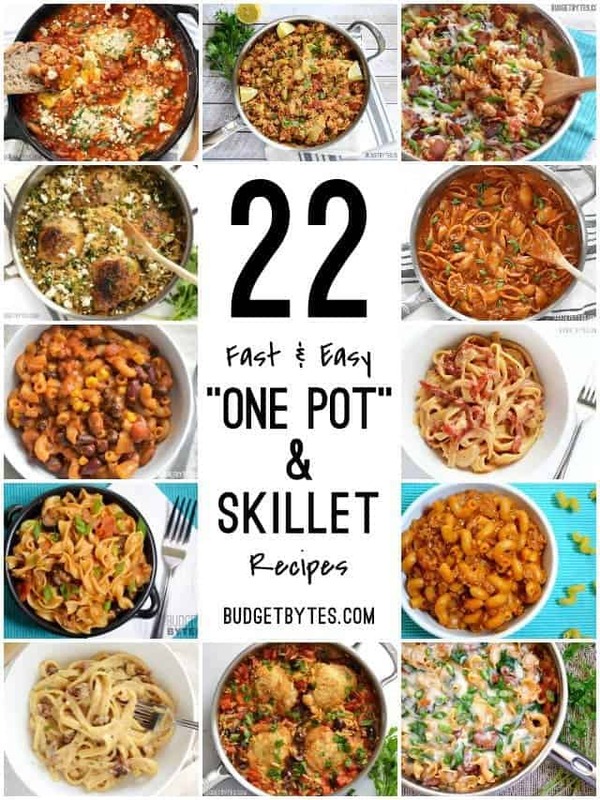 I love these one pot meals. One question: Do you use a 10inch skillet with deep sides? I’ve been using a 12inch skillet but find it’s a bit too big sometimes. Heads up that there’s a link error for the Skillet Chicken with Orzo and Olives recipe; clicking on it will send you to the 20 Minute Creamy Spinach and Artichoke Pasta recipe instead.